“Same as it ever was.” Heralded on stage by Weasel Walter’s free-form drum rumble, this is Lydia Lunch’s opening salvo. She spits the words into one of her two microphones. Repeating a line by Talking Heads does sort of make perfect sense, both artists having emerged from the vibrant underground scene that was prevalent in their native New York City in the late ‘70s. Yet for Lydia Lunch things never really do stay quite the same. The singer, poet, visual artist and spoken word performer is constantly evolving. Lydia Lunch is here at Fibbers in York with the Brooklyn-based multi-instrumentalist, composer and improviser Weasel Walter to perform Brutal Measures, a unique collaboration of voice and drums. Both artists arrive at a point where the transgressive, the unconventional and the experimental all coalesce. As Weasel Walter rattles out another manic drum fill ensnared in the most scabrous of electronic meshes, Lydia Lunch says that the sound he generates describes perfectly her current state of mind. “I’m feeling murderous again”, she screams, the words forming part of a long, flowing diatribe that denounces warmongering and those responsible for it. Man’s stupidity and greed are also firmly in the crosshairs of Lunch’s ire. Her sentiments are as undeniably powerful as they are unwaveringly political. Time and the rapid passage thereof, is another theme that runs throughout Lydia Lunch’s diction. She takes the lyrics from David Bowie’s ‘Time’, twists the words around and regurgitates them in a volley of disbelief and regret. A couple of lines from Ziggy Stardust’s ‘Five Years’ also sneak into this passage as if to further illustrate how we have all become victims of time. Weasel Walter’s drumming is an abstract storm. He creates huge sonic grooves and in so doing lays down a perfect platform from which Lydia Lunch’s delivery just takes off. During her solo spoken word sections, the music is minimal with Lunch’s rapid machine-gun fire locution providing its very own seismic rhythm. It is disturbing, urgent, compelling stuff and as she stares intently into the whites of our eyes you can see exactly why Lydia Lunch relishes the unflinching emotional intensity of performing in such small, intimate venues. 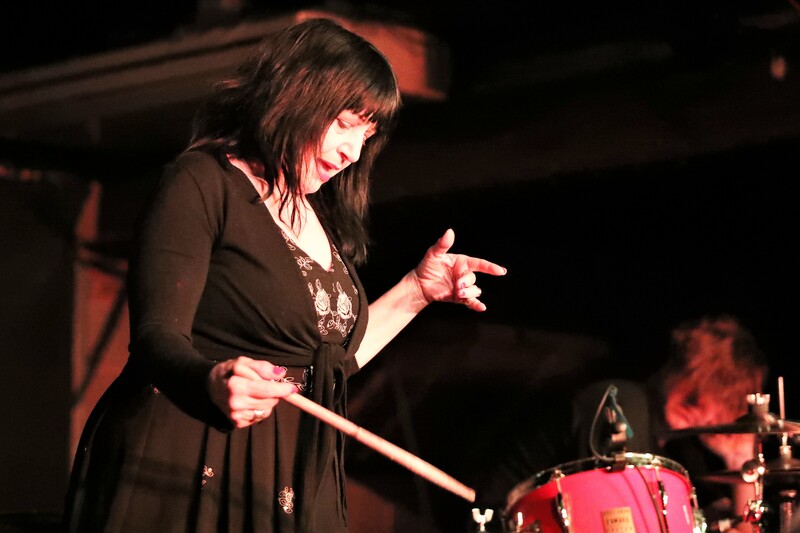 Lydia Lunch concedes that music still remains the universal language but she firmly believes that everything begins, and ends with the spoken word. Tonight goes a very long way to affirming her view.